The JBL PRX815 is a full-range speaker designed for main system and floor monitor applications. 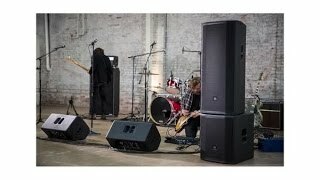 Featuring a 15”, two-way, bass-reflex design powered by a 1500-watt class-D amplifier, PRX815 delivers incredible volume in a lightweight and compact form factor. The 2-way 15” offers the perfect balance between size and performance. The PRX815 truly is an exception; it’s small, light weight, versatile and powerful with remote Wi-Fi control of onboard DSP EQ parameters. The performance and asymmetrical design make this a perfect choice for musicians, entertainers and DJ’s when portability is key, or when hung by the suspension points, an exceptional light-duty installation speaker. All PRX800 Series speakers were designed to excel in sound reinforcement where challenging audio environments and loud volumes are the norm. For applications requiring full bandwidth sound reproduction, the PRX815 delivers the optimum balance. For live music, recorded music playback and speech the user has the option of tailoring the EQ. A microphone can be directly connected to the speaker input for quick PA applications. Coupled with a PRX800 sub-woofer the system becomes an efficient, full-range sound system. The PRX815 is comprised of 15” 275G Differential Drive® woofer, a 2408H-2 37.5 mm (1.5 in) annular polymer diaphragm, neodymium compression driver mounted to a 90° by 50° horn, all driven by 1500 watt Class-D power amplifier. Sophisticated DSP is at the core of a fully featured input section, providing user selectable system EQ, protection, input sensitivity selection, cross-over functionality, dynamic limiting and discrete component optimization. All PRX800 cabinets are built from 18 mm, strong, light-weight poplar plywood made structurally sound with tongue and groove joints. All PRX800 Series cabinets are protected by JBL’s tour proven DuraFlex™ finish. Grilles are made from dent-resistant 16 gauge steel and handles are made from light-weight glass-filled nylon for added strength and durability. All M10 suspension points are constructed from 14 gauge steel and have been tested with a yield-strength of 1000 lbs. each.